Fact: US President Barack Obama and his wife Michelle have a 1,000-bottle cellar in their Hyde Park, Chicago home, well more like a mansion, but who cares!!! The important part is … WE HAVE A WINE LOVER IN THE WHITE HOUSE!!! What impact do you think this will have on US wine consumption? Do you think more Americans, heck, even people in other countries, will see his love and respect for wine and consider starting to drink wine or become more active wine drinkers? Do you think the wine laws and perception of wine drinking will “smooth” out with a wine-lover in office? Do you even care? The Ceci Sipper wants to know! Nine of the top 10 wine-consuming states voted for Obama—only Texas broke rank (boo) and voted for Sen. John McCain. 20 of the top 25 wine-consuming states went for President Obama. 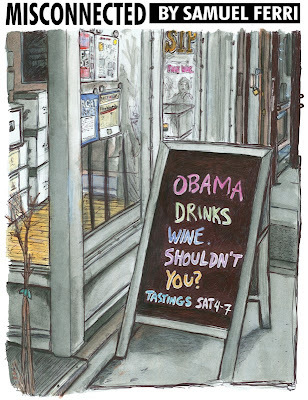 In fact, the District of Columbia and the 28 states that voted for Obama drank 79.7 percent of the 300 million cases of wine consumed in the U.S. in 2007. All though there is no official cellar, the White House currently stocks around 500-600 bottles. Thomas Jefferson amassed a 20,000-bottle collection, which he kept in a cellar that he had built under what is now the West Wing. It no longer exists. He is said to have spent more than $11,000 on wine during his terms as president, in today’s economy roughly $175,000. Richard Nixon was a Bordeaux man, especially Chateau Margaux. He supposedly got around the ‘American wine only’ ruling by having the waitstaff secretly pour it for him. The Kennedy’s also preferred Bordeaux wines. Ironically during the Prohibition era, there was no ban on alcohol in the White House. Daniel Shanks handles the wine duties at the White House since 1995. Sometimes the perfect match must be ignored to maintain a more politically correct pairing so as not to embarrass a visiting dignitary. For detailed examples of the politically correct wines served at official functions in the White House read the latter portion of source 4 : The Wine New Magazine article. Hope you enjoyed my attempt at a “political” wine entry, haha. ‘Bout dang time we get a wine drinker in the White House! Don’t be comment-shy & I hope you will tell your friends to join us here on Vinously Speaking! Previous Previous post: You can’t just walk into Burgundy….